The one thing on this record that surprised me was that it states that William was buried in a cemetery in Rome. I had always assumed that he was transported back to New York Mills to be buried with all the rest of the Williams family. Also, his name is listed on a stone in Glenside Cemetery in New York Mills. Perhaps that was just a memorial, or perhaps the death record is incorrect. 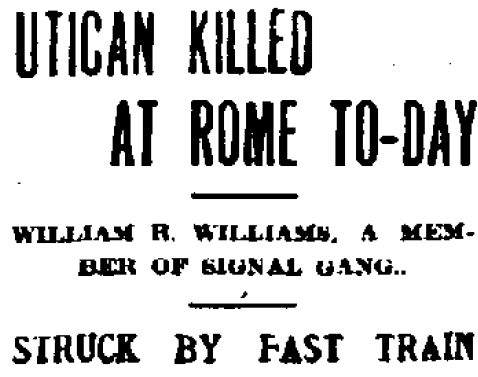 I will browse through the Rome cemetery listings online to see if I find him; he’s not on findagrave.com. I will contact Glenside Cemetery too and see if William was actually buried there. I may never know the true place where his body was buried. It is hard to be completely certain of the truth in genealogy. Time goes by, records are destroyed, memories fade. We are given clues, but one never knows when another tidbit of information will throw you a curveball. (1) Utica New York Herald Dispatch, April 8, 1907, digital image 321509, Old Fulton NY Post Cards (http://www.fultonhistory.com/Fulton.html: accessed September 18, 2012). Our ancestors endured great tragedies. They carried on because they had to.